In the Jewish Quarter of the Old City of Jerusalem, one encounters beautiful art shops. There one can find many idealized visions of a Jewish Jerusalem. One that especially struck me was a painting of the Western Wall, from a perspective that in real life would have to include prominently the Dome of the Rock. Yet there is no Dome – only a small copse of trees. There are also paintings of the Second Temple, which could be interpreted as historical paintings and not references to a hoped-for future – or both. 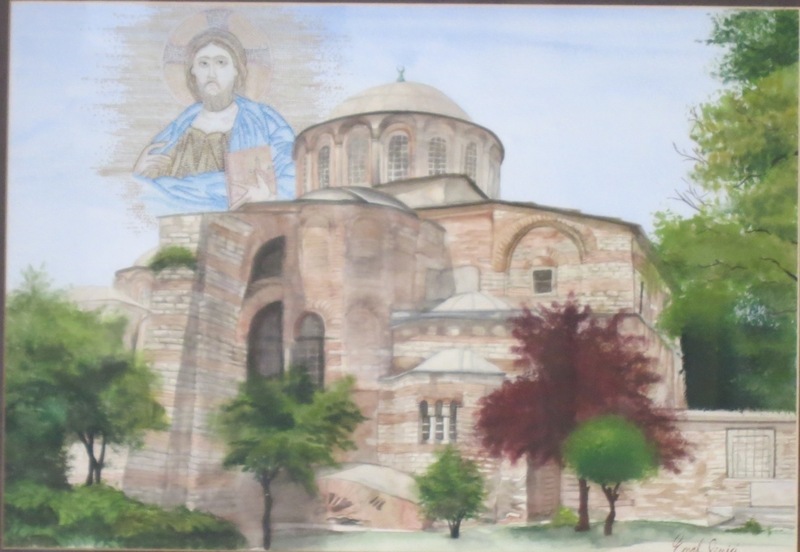 I was fascinated yesterday to come across a painting of Hagia Sophia in an art shop near the church/mosque/museum. The painting showed the church without the minarets. Superimposed in the sky to one side was the image of Jesus from one of the mosaics inside. Who is the market for this image, I wonder? Greek Orthodox visitors, or simply any Christian?